[L-R] - Public Relations officer Brian Campbell,Vice President Victor Phillip,President Jason Skeete and Operations manager of Coyaba New Dimensions Steel Orchestra, Mrs. Lisa Chase. After what was a successful hosting of Junior & Senior Panorama 2018, following its postponement the previous year, internal conflicts within the Grenada Steelband Association (GSA) have surfaced. A major scandal to hit the airwaves was news that former GSA President, David ‘Peck’ Edwards, is currently under investigation by the Financial Intelligence Unit (FIU) for misappropriation of funds. While that matter is ongoing, another threat seeks to undermine the association. During the GSA’s annual general meeting on Saturday, 22 September 2018, a no-confidence motion was put forward by Andre Greenidge of FLOW Comancheros against the association’s current president, Jason Skeete. That motion received support by 3 other members of the association including Edwards, resulting in Skeete opting to step down. A release issued by Lisa Chase, Operations Manager of Coyaba New Dimensions Steel Orchestra (NDSO), condemned the move and has deemed it unconstitutional. The release also indicated that out of the 9 bands present at the meeting at the National Stadium, only 4 voted in favour of the motion while 3 voted against. Two bands, including NDSO did not participate in the voting, as well as the 6 executive members present. However, what can be described as a change of heart, Skeete is not giving up his position without a fight. 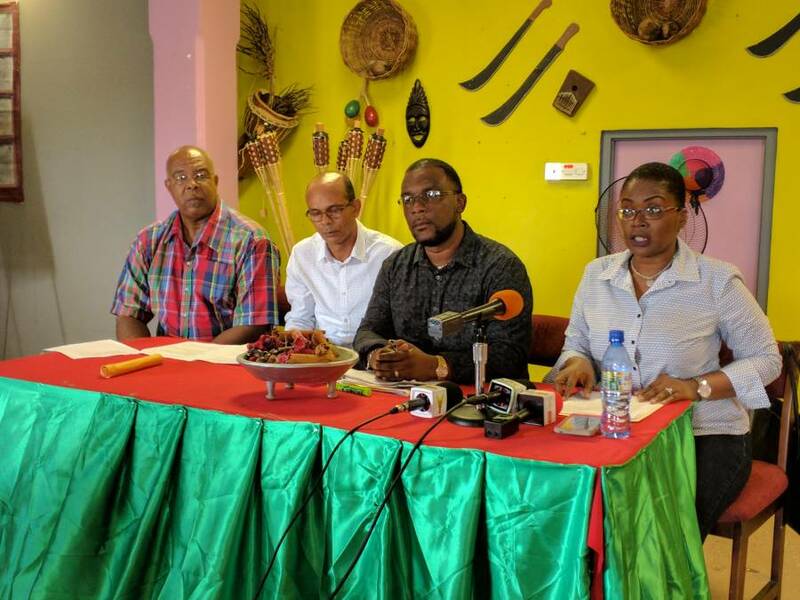 On Monday, an emergency press conference was held by Skeete, Vice President Victor Phillip, Public Relations Officer Brian Campbell, and Lisa Chase. They informed the media that the current executive is still active and is led by its president, Jason Skeete. Skeete was elected president on 14 October 2017 along with Phillip, Campbell, Treasurer Alister James, Secretary Kaycee Fredrick, Assistant Secretary/Treasurer Stephen Greenidge, and Trustee Sharmella Lee. Skeete said the disgruntled members of the association made some grave errors by not acting in accordance with the constitution, enacted and adopted by the association’s membership on the day he was elected into office. Chase said the grievances expressed by the disgruntled members were based on personal feelings towards the president and had nothing to do with his leadership, which the association is pleased with. The disgruntled members are now been given until the end of next week to rethink their position or face repercussions. Skeete indicated that the current executive has to meet and decide whether to convene a meeting with the disgruntled members with the hope that a resolution can be found. However, he did indicate that at that meeting, security precautions would be taken. Article 4 of the constitution of the GSA provides for a 2-year term for the executive but there is no provision under the constitution for the removal of the President or any other officer. Article 9 of the constitution provides a mechanism for changes to it. Amendments may be considered at an annual general meeting. At least 6 bands must support an amendment, however, no amendment was proposed at the meeting on Saturday. Contacted via telephone for a comment, Greendige denied to be interviewed on this subject. However, he did speak on Saturday following the conclusion of the AGM. Greenidge who admitted to voting for Skeete at the last elections, informed the media on Saturday of his agreement with the motion put forward.